Once again this series has delivered a solid, intriguing story full of suspense, romance, and faith. While some series might fall into a rut and begin to turn out indistinguishable heroines and monotonous plot lines, The Daughters of the Mayflower always rises to the occasion with a fresh, exciting experience. Part of this may be attributable to the fact that a variety of authors have contributed to the project. 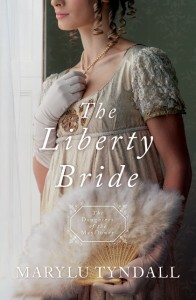 In “The Liberty Bride”, MaryLu Tyndall immerses readers in a Regency-era adventure during the War of 1812, featuring an unlikely heroine and hero. Their vulnerabilities and fledgling faith endear them to readers from the start, and the secrets that they keep ensure that there is no lack of tension. Throw in wartime conditions and you have a tightly-woven narrative that flows swiftly toward its climax, betrayal and love in its wake. The Regency period is one with which I am not very familiar, and this book certainly aroused my interest. Piracy, blockading, spies, war…wow! I appreciated the gravity of the situation from an American viewpoint. From the comfortable detachment of history, it is easy to forget that victory was far from assured and that the action of individuals such as the characters in this novel often provided the crucial turning points in battle. Then, too, there is the dramatic internal struggle that we empathize with, and while mentally bolstering the characters and pointing out their flawed thinking, hopefully we turn some of the same introspection toward ourselves as well. After all, history reflects and informs our reality, and if, as in this case, it is done well, so does fiction.